Dahlia is the duo of Keith Schreiner and Jennifer Stroker (formerly Folker) whose haunting, trancey, jazzy, hip-hoppy brand of seductive space-pop has been entrancing Portland, Oregon audiences and has been chronicled in the Tales Of The Action Man stories that grace the pages of this publication (see new story this issue). 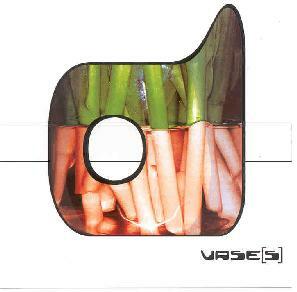 Vase[s] is the follow-up to their debut CD from 2001, Emotion Cycles, and continues their dreamy blend of ambient, hip-hop, drum n bass, and space alien influences. Dahlia excel at creating alluring songs with pop potential that are backed by intriguing electronica that incorporates multiple sounds and styles. Schreiner, the maestro behind the music, also releases albums under the moniker Auditory Sculpture. Exploring the same realms as that heard in Dahlia's music, Auditory Sculpture also includes elements of Tangerine Dream, Klaus Schulze and Ash Ra Tempel. So the music backing Dahlia is definitely out there, and it's refreshing to hear songs based in contemporary pop styles that are backed by adventurous, creative music. An excellent example of Dahlia's difficult to describe combination of styles is the techno space rap heard on "Don't Underestimate Me". The core song would fit comfortably on MTV. But the music... this is freaky stuff folks. Spaced out and with loads of different electro bits swimming around. Some of my favorite tracks are those that include the light jazz trumpet of guest Derek Sims, who adds tasty embellishment to the music and produces a sound that recalls Mark Isham's contributions to the great Cloud About Mercury album of several years ago. Overall, an impressive blending and blurring of styles that injects ample doses of space into the pop. Be sure and put the disc in your computer because it's an enhanced CD with two non-album tracks and a video (my PC wouldn't play the video). For more information you can visit the Dahlia web site at: http://www.dahliamusic.com. Dahlia appears in the "Tales Of The ACTION MAN: Blackmailers Don't Dance" story that appears in the issue. CLICK HERE to read.